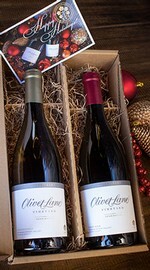 Show your appreciation for friends, family & the holiday season by toasting with our small-production, estate grown selections from our iconic Olivet Lane Estate Vineyard, nestled in the heart of the Russian River Valley. Each gift is packed and shipped in a limited edition keepsake box with handwritten notecard. Shipping Included in the continental US.